Hytec Drive SecureSM provides a value-added client solution and excellent opportunities to realize service revenues. All digital imaging equipment contains at least one hard drive that stores data, which may be confidential. This data is most susceptible to a security breach when the hard drive is replaced, or at the end of lease. Hytec Drive SecureSM provides full hard drive sanitization & data destruction services based on your needs. The Hytec Drive SecureSM program is fully insured and bonded, and Hytec is a member of the National Association of Information Destruction (NAID). This is Hytec’s turn-key solution that provides HD replacement and destruction services, with secure chain-of-custody and shipping. A perfect solution for service providers who are comfortable taking possession of a client’s drives, sending them to Hytec for data erasure, and then receiving a certificate of data destruction and a clean drive. This supports all green initiatives, and allows service providers to offer a very competitive client solution at lease end. This service option completely destroys drives by an industrial-grade shredding process, randomizing discharge material, and rendering all data completely unreadable. Your client prefers to handle the disposition of hard drives? Hytec offers client-direct solutions to eliminate any potential dealer liability, but also allows you to provide a value-added solution. Please refer your clients to contact Hytec directly at 855-HYTEC-DS (855-498-3237) to learn more about this service. 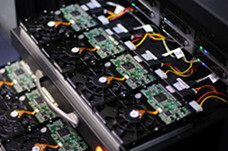 Hytec recommends shipping all hard drives directly from the customer's physical location to avoid potential liability. Where should I send my hard drives and which shipping method is the most secure? After filling out and signing our authorization release form, all hard drives should be mailed to: Hytec Dealer Services, Attn: Drive Secure, 3600 Vineland Road, Suite 121 Orlando, FL. 32811. Hytec recommends using carriers such as UPS, Federal Express and the United States Postal Service. If you require additional levels of security, we suggest registered mail via the USPS, or High Value declaration for UPS and FedEx. These services will provide for even more secure shipping at additional fees from the carriers. 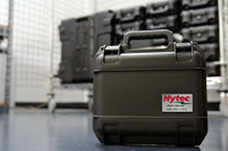 Hytec also offers secure chain-of-custody options. Please contact a customer service representative for more information. What happens to the Hard Drives once they are received and how do I know they are secure? Hytec follows the guidelines and processes set forth by the National Association of Information Destruction (NAID). Once the drives are identified and received in our secure facility, all hard drives are scanned in by serial number, recorded and locked in a secure staging area. Hard drives are then moved to a secure room where the sanitization or shredding service is completed by an authorized member of our staff. All events are time stamped, video recorded with a complete audit trail. Hytec Drive SecureSM services are completed within 36 hours and are guaranteed of complete data removal with a certificate of destruction. Which service is more secure, Shredding or Sanitization? Both services through Hytec Drive SecureSM completely remove the data and are guaranteed through a certificate of destruction. Our Shredding service destroys drives by an industrial-grade shredding process, randomizing discharge material, and rendering all data completely unreadable. Our sanitization service completely overwrites the data in accordance to the U.S. Department of Defense directive 5220.22-M.
What types of Drives are supported by Hytec Drive SecureSM? All hard drives can be completely destroyed by our industrial grade shredding process. Our sanitization service can remove data from most any SATA and IDE hard drives. Currently we do not provide sanitization to SCSI hard drives. What is the time frame for the data destruction services through Hytec Drive SecureSM? Standard turnaround time at Hytec’s facility is 2-3 business days from receipt of your item. Once the destruction service is completed, a Certificate of Destruction will be issued, certifying the data on the drives has been completely removed. What happens to any pre-installed system software on the hard drives I send in for sanitization? Hytec Drive SecureSM sanitization process completely overwrites any data on the hard drive including any pre-installed software. Any system software required on that drive would subsequently need to be re-installed. What type of Guarantee does Hytec Drive SecureSM offer on the destruction of my data? A certificate of data destruction is issued on each order. 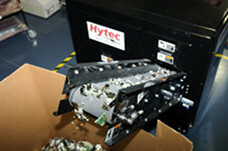 Hytec guarantees that the data has been completely removed by means of Sanitization or Shredding. We are insured up to $5million for each occurrence if any data is subsequently leaked due to our negligence.